Flavien Prat sent Little Red Feather and Marsha Naify's Fashion Business at the half-mile pole in Saturday's Grade 2 Del Mar Handicap, capitalizing on a slowing pace to win the gelding's first graded stakes race by open lengths. The 4-year-old son of Frankel covered 1 3/8 miles over Del Mar's firm turf course in 2:13.84. Trained by Phil D'Amato, Fashion Business was sent off at odds of 4-1. The 7-2 favorite Itsinthepost finished off the board. The win earns Fashion Business an expenses-paid berth to the Breeders' Cup Longines Turf this fall at Churchill Downs. After an easy break, Prat kept Fashion Business behind horses while second-last. He sensed that the fractions, set by Kenjisstorm, were slow, and let the gelding creep up a few spots. The entire field of 11 was covered by just eight lengths down the backstretch. At the half-mile pole, Prat gave Fashion Business his cue and sent the gelding flying four-wide around the turn. The pair hit the lane with a two-length lead, and continued to draw away down the stretch to cross the wire about six lengths the best. Ya Gotta Wanna ran on well to finish second, while Multiplier finished third. Colonist was fourth. Bred in Great Britain by Andrew Rosen, Fashion Business broke his maiden overseas at the beginning of 2017, then came to the United States. 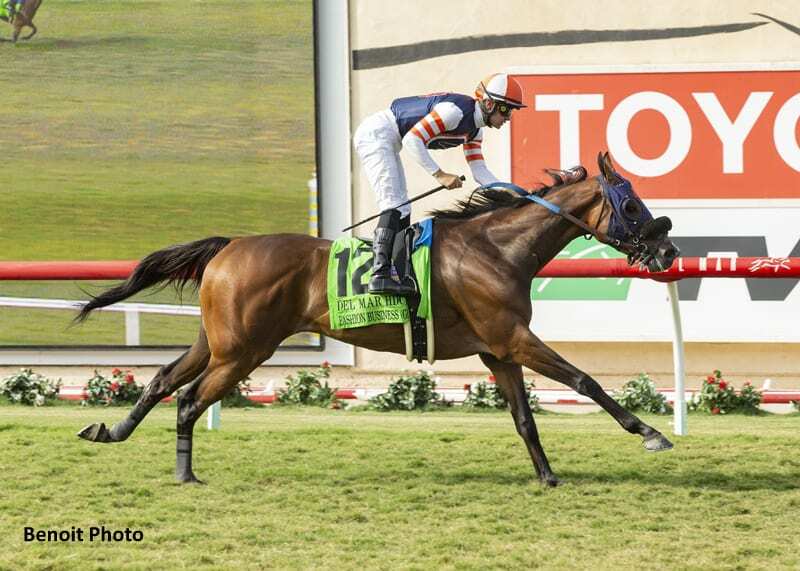 He did not find the winner's circle again until May of 2018, and the Del Mar Handicap is the gelding's third career win. Fashion Business has earned over $280,000 in his 12 starts. This entry was posted in Breeders' Cup, NL List and tagged Del Mar, Del Mar Handicap, del mar thoroughbred club, fashion business, flavien prat, Frankel, Little Red Feather, Phil D'Amato by Paulick Report Staff. Bookmark the permalink.